Submitted 10 months 1 week ago by feeds user. LaserLyte® Rumble Tyme Laser Sight and Trainer Kit Laser sight and laser trainer in one Constant-dot and flashing-dot modes Rymble Tyme laser target rumbles when hit Auto-off feature conserves batteries Easy installation No time to practice at the range? No problem – just hone your skills at home with LaserLyte's Rumble Tyme Laser Sight and Trainer Kit. The Lyte Ryder laser sight combines a laser sight and laser trainer in one lightweight package. In laser-sight mode, the Lyte Ryder puts you accurately on target and adjusts to the bullet impact. Choose between constant-dot or flashing-dot modes. In laser-trainer mode, the Lyte Ryder flashes the laser for 1/10 of a second. The light appears as a dot to indicate a good shot or as a streak to show that your technique needs some work. 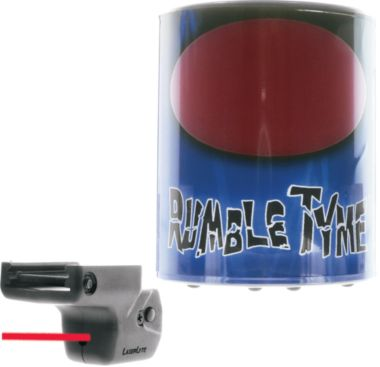 The Rumble Tyme target lights up and rumbles when you hit it with the laser trainer. Auto-off feature on the Lyte Ryder conserves the batteries. Laser fits most sub-company and full-size pistols with rails. Easy installation. Includes Lyte Ryder laser sight/trainer, Rumble Tyme target and two different sized housings for a custom fit on your gun.